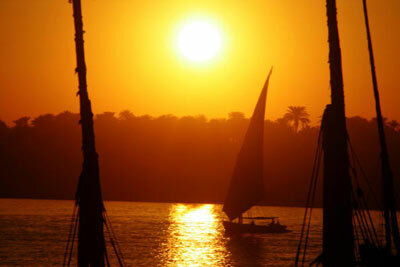 The Rising of the Water in Egypt 25 B.C. The Rising of the Water, 25 B.C.
. . . but at the rising of the Nile the whole country is under water and becomes a lake, except the settlements; and these are situated on natural hills or on artificial mounds, and contain cities of considerable size and villages, which, when viewed from afar, resemble islands. The water stays more than forty days in summer and then goes down gradually just as it rose; and in sixty days the plain is completely bared and begins to dry out; and the sooner the drying takes place, the sooner the ploughing and the sowing; and the drying takes place soonest in those parts where the heat is greater. The parts above the Delta are also watered in the same way, except that the river flows in a straight course about four thousand stadia through only one channel, except where some island intervenes, of which the most noteworthy is that which comprises the Heracleiotic Nome, or except where the river is diverted to a greater extent than usual by a canal into a large lake or a territory which it can water, as, for instance, in the case of the canal which waters the Arsinoite Nome and Lake Moeris and of those which spread over Lake Mareotis. In short, Egypt consists of only the river-land, I mean the last stretch of river-land on either side of the Nile, which beginning at the boundaries of Ethiopia and extending to the vertex of the Delta, scarcely anywhere occupies a continuous habitable space as broad as three hundred stadia. Accordingly, when it is dried, it resembles lengthwise, the greater diversions of the river being excepted. This shape of the river-land of which I am speaking, as also of the country, is caused by the mountains on either side, which extend from the region of Syene [Aswan] down to the Egyptian Sea; for in proportion as these mountains lie near together or at a distance from one another, in that proportion the river is contracted or widened, and gives to the lands that are habitable their different shapes. But the country beyond the mountains is for a great distance uninhabited.